Transporting your mat and keeping it all rolled up can be a hard task going to and from yoga class. Whether in your car, on foot, or on your bike, the 2-in-1 belt and sling combo is the perfect solution for yogis on the go! The strap is 100% super soft cotton, so it's easy on your shoulders, plus the beautiful soft green color is simple and stylish for both men and women. Not only are you getting the benefits of using this as a comfortable mat carrier on-the-go, this also doubles as your go-to yoga belt strap in class! Seamlessly travel with your mat and strap. It's so slick, everyone will be asking you where you got it! The strap/sling is based off a traditional yoga belt strap which helps extend your reach in poses and assist those hard to reach hand holds. 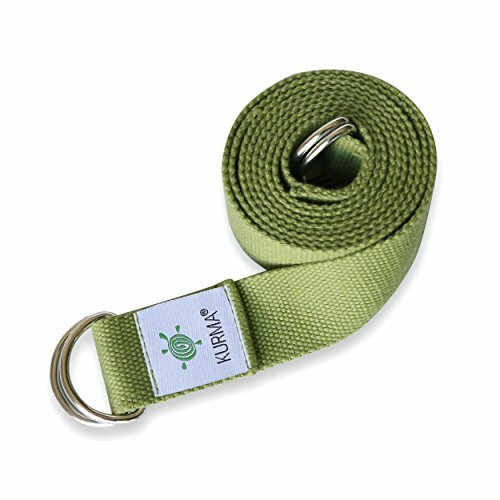 A yoga strap or yoga belt is a crucial tool to any level yoga practice. By simply adding a double D-ring to the other end of a classic yoga strap, it turns an already important yoga tool into a can't-live-without yoga mat carry sling! If you are interested just for stretching, wait until you use it as a sling-you won't be sure which version you love most! Small carabiner included for attaching keys in carry mode! You will LOVE this versatile strap! Add to Your Cart Now! BEGINNER to ADVANCED, MEN and WOMEN - Can be used for all types and levels of yoga. Use as a holder to tote your mat and have your own yoga belt to use in class! If you have any questions about this product by Kurma Yoga, contact us by completing and submitting the form below. If you are looking for a specif part number, please include it with your message.